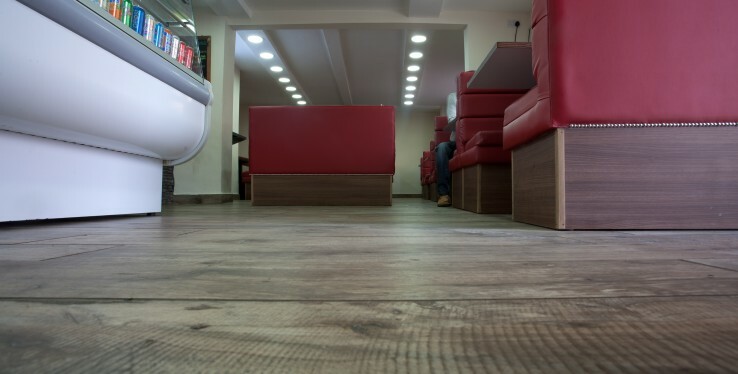 Riz Ashraf, owner of the highly regarded Kabana, was keen to find a solution to his flooring challenge for the ethnic eaterie. He wanted a real wood floor, however this was proving costly and the maintenance would be high. He then turned to looking at laminate and vinyl wood-effect flooring but disliked the plastic finish, and wanted a more quality feel. Researching options online, Riz came across Flaviker's striking porcelain wood effect tiles. These mimic wood, and being made of porcelain are highly durable and easy to maintain. Riz explains: "I then started to investigate NW stockists and came across Real Stone & Tile. Leigh Price at the showroom couldn't be more helpful. His price was extremely keen and service was amazing. I am thrilled with the finish – it has added such a premium feel to the restaurant. We have always been associated with casual dining and therefore opened at lunchtime only. The new flooring has created much more of a high end finish, and we are now considering opening for evening meals, so attracting customers wanting a special night out."